1. Tell us something about your Band Street. Who are you, and how would you describe your identity as a band? Barrio Latino is the first Timba orchestra from Hungary. Our original songs are all timba, but we also play classic salsa covers (like „El Cantante“) and latin-jazz songs. 2. What country are you from originally? All band members are from Hungary (including myself as the composer), but our lead singer Mario Ochoa is from Hunduras. Sometimes we collaborate with Cuban musicians like Danny Lozada (ex-Charanga Habanera) who lives is Las Vegas now, and Leo Wilber who lives in Italy. 3. Since when do you play music together, and how did you meet? Barrio Latino is started around 2005 as a latin-jazz orchestra, but since then most musicians changed in the band. Most of the people we have now are playing in the band more than a year or two now. 4. What are your impressions of Germany, in general but also regarding salsa? To be honest, I have been in more than 60 countries around the world from Argentina to Asia and Australia, but I have never been in Germany. Which is ridiculous because it’s so close to Hungary. But we are definitely planning to make concerts in Germany with Barrio Latino, especially because many people are buying our music from there on iTunes, so there are many people already asking us when will we make a live concert there. 5. What – and when – was your first contact with salsa music? I was 16 years old when I got two albums, one of them is from Arturo Sandoval and the other one is from Michel Camilo. Which is not salsa, but these albums had a great influence on me, introducing the Latin genre. 6. What role does salsa play in your life? It’s one of the best feeling to see people from all around the world dancing to the music we created, especially because we are not a Cuban band. Salsa music is the best connection between the musicians and the dancers, because people really feel what we are creating on the stage. 7. What was your most wonderful experience as a band? We published our first song in 2013 September. A few months later we started to find videos on Youtube where people dancing to the song. I think that was one of the most wonderful experience. 8. Which salsa style(s) do you prefer and why? I’m not a dancer but I prefer Cuban and timba style because the music is much more advanced, it requires an advanced level of understanding from a dancer. So I really appreciate if someone takes the effort to get into this style and have a deeper understanding about the music and the style. 9. What is your advice for salsa beginners? I think if someone is from Latin-America, the music is not strange for them, because they grew up listening these kind of musics. But it is very strange for the ear of an European, because our music is very different. So I think the best advice would be to listen more and more salsa music to really understand it. 10. How would you advertise salsa to someone who doesn’t know anything about it? I would say: Salsa is one of the richest and deepest musical language in the world, and people enjoy it in every country on the planet. Most of these people doesn’t even speak Spanish, so it’s have to be the music and the lifestyle which somehow enchant all those people. 11. Do you share a common taste in music as a band? If so, what is your favorite salsa song or performer? We have many common music preferences, because most band members are very close to jazz music or even has a jazz degree from some kind of music school. We all like the old classic salsa songs from Hector Lavoe and Fania records, that’s why we usually play cover songs from those years. 12. What kind of music do you guys listen to besides salsa? Most of us have very mixed music preferences, because as a musician we can find beauty in almost any music genre. My favorite music list is very long, but here are some new favorites: Snarky Puppy, Dirty Loops. It could sound strange, but I believe those bands musical language is really close to Salsa music, and I just wrote a music theory book about this, but that’s another story. 13. Do you have a common motto or favorite citation? 14. What are your plans as a music band for the next year? 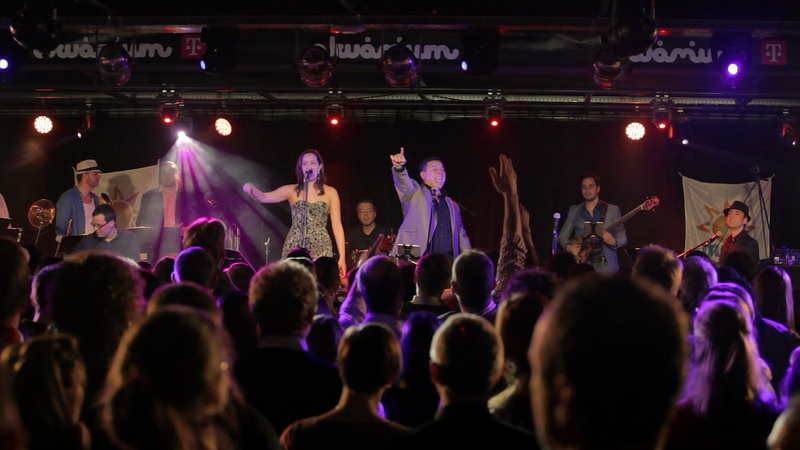 We organized a successful concert in our own city, Budapest last December, where more than 500 people came to listen to us on a Monday night. Now we are planning to make concerts in more major cities around the world. And of course most of our concerts are on festivals, and we already have some invitations to festivals for the next year. 15. How can fans best contact you?